Israeli forces continued with systematic crimes, in the occupied Palestinian territory (oPt), for the week of 01 – 07 November, 2018. Israeli forces continued to use excessive force against unarmed civilians and peaceful protestors in the Gaza Strip. A civilian succumbed to wounds he sustained during his participation in the Return and Breaking Siege protests. 77 civilians, including 12 children, a woman, a journalist and 3 paramedics, were wounded; 4 of them sustained serious wounds. In the Gaza Strip, the Israeli forces killed ‘Emad Shahin (17) from al-Nussairat refugee camo when the Israeli soldiers stationed along the border fence between the Gaza Strip and Israeli, east of al-Maghazi in the central Gaza Strip opened fire at 3 Palestinian children and youngsters who approached the border fence. As a result, one of them was wounded, arrested and then taken by a helicopter to Soroka Hospital. On 14 November 2018, the Israeli media declared his death after succumbing to his wounds. On 07 November 2018, the medical sources at al-Ahli Hospital in Hebron declared the death of Ahmed al-Najjar (21) from Khan Younis after he succumbed to wounds he sustained during his participation in the Return Protests, east of Khuza’ah, east of the City. The above-mentioned civilian was wounded on 26 October 2018 with a bullet that penetrated his abdomen and exited his back during his participation in the Return protests near the Return encampment in eastern Khuza’ah. At that time, he was referred to the Gaza European hospital where his condition was described as serious and after few days he was referred to al-Ahli Hospital in Hebron until his death was declared. In the same context, on 02 November 2018, the medical sources declared the death of Mohammed al-Rifi (13) from al-Nafaq Street in Gaza City after he succumbed to wounds he sustained in the 2014 offensive on the Gaza Strip. As part of using excessive forces against the peaceful protests along the Gaza Strip borders, the Israeli forces during the reporting period wounded 77 civilians, including 12 children, a woman, a journalist and 3 paramedics. Four of those wounded sustained serious injuries. As part of targeting the Palestinian fishermen in the sea, the Israeli forces continued to escalate their attacks against the Palestinian fishermen, indicating the on-going Israeli policy to target their livelihoods. During the reporting period, PCHR documented 3 attacks against the fishermen in the north-western Beit Lahia in the northern Gaza Strip. However, no casualties or damage to the boat was reported. In the West Bank, during the reporting period, the Israeli forces wounded 12 Palestinian civilians, including 3 children and a woman, in separate shooting incidents. 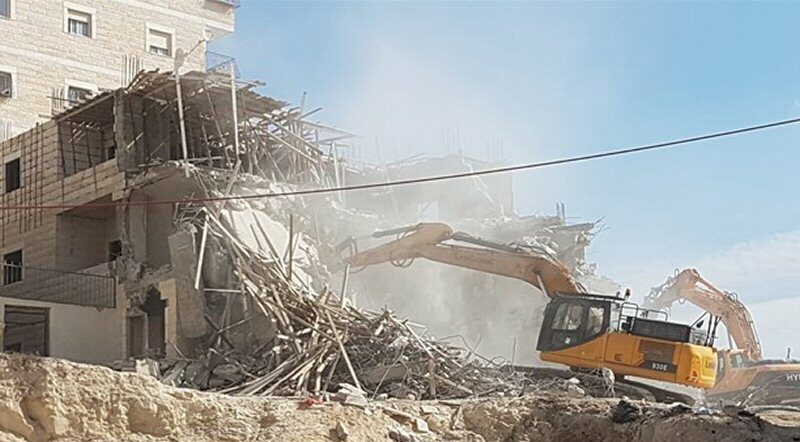 As part of the Israeli house demolitions and notices, on 06 November 2018, the Israeli forces demolished 2 residential houses belonging to the family of Kamel al-Rajabi and his sons in al-Aqshqariyah neighbourhood in Beit Hanina, north of occupied East Jerusalem under the pretext of building without a license. The 130-square-meter houses were built 4 months ago and sheltered 3 families of 12 members, including 5 children. On the same day, the Israeli municipal bulldozers demolished a commercial facility in Beer Ayoub neighbourhood in Silwan village, south of occupied East Jerusalem’s Old City, udner the pretext of unlicensed construction. The facility belonged to Mohamed ‘Odah and was built a year and a half ago on an area of 20 square meters. The facility is a canteen for selling sandwiches and drinks and supported 3 families. On 07 November 2018, Israeli municipal bulldozers demolished a residential building in Sho’afat refugee camp, north of East Jerusalem’s Old City, belonging to Mahmoud al-Jaradat under the pretext of the unlicensed construction and its closeness to the annexation wall. The building was comprised of 4 floors; 3 of which were residential and a ground floor that was used as a car parking. The building was 600 square meters and included 12 residential apartments; 8 were ready for inhabitation. As part of demolition of houses and other civil objects, on 05 November 2018, the Israeli forces demolished, uprooted and confiscated 3 barracks and 5 tents belonging to ‘Omer Bshara in Kherbet Bzeiq in the Jordan Valleys, east of Tubas on 05 November 2018. Two of these barracks and tents were residential while one of them was used for sheltering sheep. The Israeli forces confiscated tin plates and the tents and later withdrew. As part of the Israeli settlers’ attacks against the Palestinians civilians and their property, PCHR’s fieldworkers documented 4 attacks by settlers, including 2 in Hebron and 2 in Nablus. As a result of those attacks, 7 civilians, including a baby girl, were wounded. At approximately 07:30 on Saturday, 02 November 2018, Mohammed Nasser Ziyad al-Refi (13), from al-Nafaq Street in Gaza City, succumbed to wounds he sustained in the 2014 Israeli offensive on the Gaza Strip. Mohammed was wounded on 21 August 2014, when he and his family were in an agricultural land owned by his grandfather, near the house. An Israeli warplane launched a missile at them, causing the death of 3 persons namely Mohammed Ziyad al-Refi (28), his brother Nasser (38) and his son Omer (9), who is Mohammed’s twin. Few days later, Maram Tareq al-Refi (7) and her brother Ziyad (9) succumbed to their wounds. Mohammed suffered from his injury as he was hit with a shrapnel to neck vertebrae, causing a cut to the spinal cord and lead to quadriplegia. Mohammed was transferred to Mar Youssef Hospital in Jerusalem, but doctors could not treat him, so he came back to Gaza City. Mohammed stayed at Al-Wafa’ Hospital for Medical Rehabilitation & Specialized Surgery in al-Zahra’a City as he was artificially breathing. His health condition deteriorated and he lost consciousness for 10 days and then died. The Northern Gaza Strip: 11 civilians, including 3 children and a woman, were wounded. Four of them were hit with live bullets and their shrapnel, 4 were hit with rubber bullets and 3 were hit with tear gas canisters. doctors classified a civilian’s injury as serious. In Gaza City: 15 civilians were wounded. Nine of them were hit with live bullets and their shrapnel, 2 were hit with rubber bullets and 4 were hit with tear gas canisters. doctors classified a civilian’s injury as serious. Khan Younis: Israeli forces’ shooting at demonstrators, which continued 18:30, resulted in the injury of 18 civilians, including 3 children. Six of them were hit with live bullets, 11 were hit with tear gas canisters and one civilian was hit with a rubber bullet. Rafah City: Israeli forces’ shooting resulted in the injury of 12 civilians, including 2 children. Seven of them were hit with live bullets, 4 were hit with tear gas canisters and one civilian was hit with a rubber bullet. Doctors classified 2 civilians’ injuries as serious. Ibrahim Mazen Suleiman Abu Talikh (19), a paramedic volunteering at Rozan al-Najjar Medical Team from Rafah, was hit with a live bullet to the right leg. Saber Mousa Saber Hasan (40), Nurse Volunteer Officer from Beit Hanoun, was hit with a rubber bullet to the left arm. The wounded journalist was identified as Ahmed ‘Isam Sobhi Shaqurah (25), a journalist at Palestine Company for Media Production from Sheikh Redawn neighborhood in Gaza City, was hit with a rubber bullet to the head. At approximately 21:30 on Wednesday, 17 November 2018, medical sources at al-Ahli hospital in Hebron announced the death of Ahmed Khalid Slaman al-Najjar (21), from Khan Younis, succumbed to wounds he sustained during his participation in the Return demonstrations, east of Khuza’ah, east of Khan Younis. According to PCHR’s fieldworker, on Friday, 26 October 2018, Ahmed was hit with a live bullet fired by Israeli forces. The live bullet penetrated the abdomen and existed from the back. Ahmed was admitted to Gaza European Hospital and doctors classified his injury as serious. After few days, Ahmed was transferred to al-Ahli Hospital in Hebron to receive medical treatment. He stayed in the hospital until his death was announced on the same day evening. Following the Friday prayer on 02 November 2018, dozens of Palestinian, civilians international human rights defenders and Israelis organized protests in Ni’lin and Bil’in villages, west of Ramallah and al-Mazra’ah al-Gharibiyah, northwest of city in protest against the annexation wall and settlement activities. Israeli forces used force to disperse the protestors by firing live and rubber bullets, sound bombs and tear gas canisters. The soldiers also chased the protestors into olive fields and between houses. As a result, a 25-year-old civilian, from al-Mazra’ah al-Gharbiyah village, was hit with a Two-Two bullet to the right foot. He was taken to the Istishari Arab Hospital in al-Rihan Suburb, north of the city. Doctors classified his injury as moderate. At approximately 16:30 on the same Friday, a group of Palestinian civilians organized a protest from the center of Qalqiliyah into the western entrance (al-Naqqar neighborhood) to the abovementioned city. Israeli forces stationed in the vicinity of the abovementioned entrance fired sound bombs and tear gas canisters at the protestors. As a result, a 17-year-old child was hit with a rubber bullet to the foot. At approximately 06:00 on Tuesday, 06 November 2018, the Israeli Municipality bulldozers demolished 2 houses belonging to al-Rajabi Family in al-Ashqariyah neighborhood in Beit Hanina village, north of occupied East Jerusalem under the pretext of unlicensed construction. 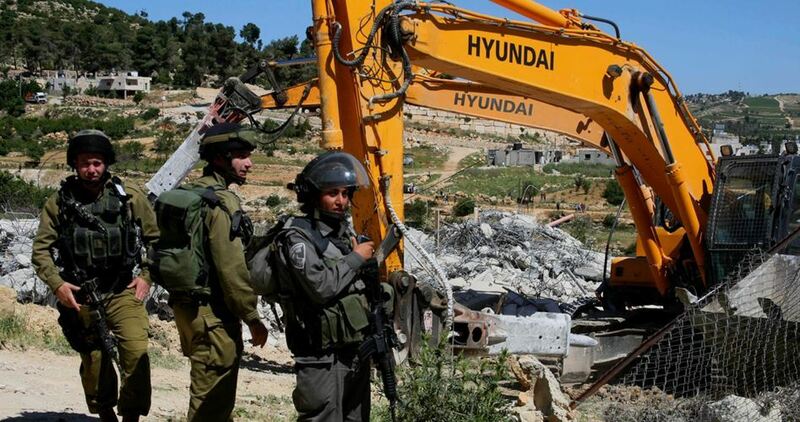 Mohammed Kamel al-Rajabi, the son of the two houses’ owner and of those affected by the demolition, said that the Israeli municipal staffs moved along with the Israeli forces and bulldozers into al-Ashqariyah neighborhood. They surrounded his house and his family house without any prior warning, forcing them to leave the houses. They also attacked his family members and pushed them in addition to forcing them to stay away from the vicinity of the 2 houses and prevented them from taking the furniture out. The bulldozers then started demolishing the two houses. Al-Rajabi said that the two houses were built on area of 130 square meters 4 months ago. He added that the Israeli municipality had issued a decision to demolish both houses, but they referred to the court which froze the decision at the time. However, the demolition was applied on the abovementioned day morning before the imposed fine of NIS 10,000 being paid. Al-Rajabi also said that building belonged to his father and sheltered 3 families; his family, the family of his brother ‘Adel; and his elderly father and crippled mother, i.e. 12 members, including 5 children. At approximately 09:00 on Wednesday, 07 November 2018, Israeli municipal bulldozers demolished a residential building in Sho’afat refugee camp, north of occupied East Jerusalem’s Old City under the pretext of unlicensed construction and its closeness to the annexation wall. Mahmoud Jaradat, the building’s owner, said that large forces of Israeli soldiers accompanied with 3 bulldozers and municipal staffs moved into the Camp and completely surrounded the residential building. They closed all the roads leading to it and expelled its residents to start demolishing the building for unlicensed construction. He added that the building was built a year and a half ago, and the Israeli municipality 8 months ago issued a decision to demolish it. At that time, the lawyer managed to freeze the demolition decision and follow the license procedures. On Tuesday, 06 November 2018, the Israeli municipality issued a decision to demolish the building and the lawyer could not head to the court as the decision was issued in late hours. Jaradat explained that the building was comprised of 4 floors; 3 were residential and the ground floor was used as a car parking. He said that the building was on an area of 600 square meters and included 12 apartments; 8 were ready for habitation. He added that the 2 families; who are al-Baytouni and Abu Shames, lately moved to the 2 apartments, but today were expelled and the demolition was implemented while some of their furniture was still inside. It should be also noted that many families had also bought apartments in the building. At approximately 10:00 on Sunday, 04 November 2018, the Israeli forces backed by a military vehicle and accompanied with a vehicle belonging to the Israeli Civil Administration, moved into al-Sheikh Valley area adjacent to the Bypass Road (60), east of Beit Ummar village, north of Hebron. They deployed in the vicinity of an under-construction house built on an area of 150 square meters and belonging to Thaer Mahmoud ‘Ali al-‘Allamah. The Civil Administration officer then handed the abovementioned civilian a notice to stop the constriction works in his house under the pretext of unlicensed building. The soldiers attempted to confiscate a truck full of construction materials parked in front of the house. However, the residents of the village intervened and the truck left the area without the Israeli soldiers’ stooping it. At approximately 08:00 on Monday, 05 November 2018, the Israeli forces backed by military vehicles and accompanied with a vehicle belonging to the Israeli Civil Administration, a bulldozer and crane moved into Bzeiq Kherbeh in the Northern Jordan Valleys, east of Tubas. The soldiers deployed between the farmers’ tents and the bulldozer started destroying and uprooting 3 barracks of 250 square meters, 5 tents; 3 donated by the Local Governance Ministry and 2 by ACTED along with the barracks belonging to ‘Omer ‘Amer Bsharat. Two barracks and tents are residential while one is used for sheltering sheep. The Israeli forces then confiscated tin plates and tents and later withdrew. At approximately 09:00 on Monday, 05 November 2018, the Israeli forces backed by military vehicles and accompanied with a vehicle belonging to the Israeli Civil Administration moved into Khelet al-Dabe’a and Sarourah areas, southeast of Yata, south of Hebron. They along with the Civil Administration officer raided Khelet al-Dabe’a Mixed School that was inaugurated in October 2018 and took photos of it. They then hanged on one of its walls a notice to stop construction works in it under the pretext of unlicensed construction. It should be noted that the Israeli authorities on Wednesday morning, 11 July 2018, raided Kherbet Khelet al-Dabe’a School and confiscated its buildings under the pretext of unlicensed construction. The Civil Administration officers also handed notices to stop construction works in dwellings belonging No’aman Shehdah Hamamdah who supprts a family of 13 members; Hussaein Ahmed Hamamdah who supports a family of 10 members; ‘Adlah Hussein Hamamdah who supports a family of 7 members; and Jamal Mousa Hamamdah who supports a family of 5 members in addition to a 2-square-meter bathroom. The notices gave those civilians 7 days to settle their legal affairs. At approximately 18:00 on Friday, 02 November 2018, dozens of settlers, who came to Hebron in order to celebrate the so called “Sarah Shabbat,” attacked civilian houses in the neighborhoods of Ghaith and al-Salaymah in the southern area of the Ibrahimi Mosque in Hebron’s Old City. As a result, a number of civilians sustained bruises and injuries and were taken to Hebron Governmental Hospital. The attack occurred in front of the Israeli Border police officers and soldiers who were in the area to secure the passage of settlers for the celebration organized in the Ibrahimi Mosque Yard and in the vicinity of the Mosque without the soldiers’ intervening and stopping their attack. At approximately 20:30 on Sunday, 04 November 2018, Israeli settlers from “Yitsihar” settlement attacked a 2018 Palestinian Opel Corsa Grey Car driven by ‘Ali Rafiq Mohammed Shawahneh (38) from Kafr Tholth village, east of Qalqilya. He was with his wife, Aminah Shaher al-Tawil (29) and their 4-month daughter, Isle, sitting next to the driver’s sea while in the backseat her brother, Baker Shaher al-Tawil (28) was sitting with his wife Alaa’ Sa’ed al-Deen ‘Odah (23). The car was attacked while they were traveling on “Yitsihar” Bypass Road. As a result, the car structure was damaged and Isle sustained bruises after she fell off her mothers’ hand. Moreover, Alaa’ fainted out of fear she felt. The Israeli forces called an Israeli ambulance and those wounded stayed inside it for 40 minutes for treatment. After that, a PRCS ambulance arrived and took them to Rafidia Governmental Hospital in Nablus for treatment. At approximately 11:00 on Wednesday, 07 November 2018, Israeli settlers from “Yitsihar” settlement and backed by Israeli forces attacked al-Safafir area, east of ‘Orif village, south of Nablus. They threw stones at ‘Orif High School, so a number of civilians gathered and threw back stones at the Israeli settlers and soldiers. The Israeli forces immediately responded and fired live bullets and rubber-coated metal bullets at the civilians. As a result, 3 civilians, including a child, were wounded and taken to Rafidia Governmental Hospital in Nablus for medical treatment. Their condition was described as moderate. Fully detailed document available at the Palestinian Centre for Human Rights (PCHR). The Quds Center for the Study of the Israeli-Palestine Affairs has kept record of 421 violations perpetrated by the Israeli occupation forces and authorities against the Palestinians in October. The list of violations includes movement crackdowns, arbitrary checkpoints, abrupt closure of access roads, demolition of vital structures and civilian homes, land confiscation, and property theft, among others. Director of the Quds Center, Emad Abu Awad, said the violations make part of an Israeli policy systematically pursued against the Palestinians. At the same time, the Israeli occupation continues to provide legal and security shields to Israeli settler gangs, whose crimes and attacks against Palestinians and their property often go unnoticed. Abu Awad urged the international human rights institutions to take immediate action over Israel’s simmering violations against the Palestinian people, land, and property.